I enjoyed one of my most gratifying experiences at Mercy High School three weeks, ago. After school following the last exam on the last day of school the iWizards had their “dress rehearsal” for the August 16, new student tech orientation. 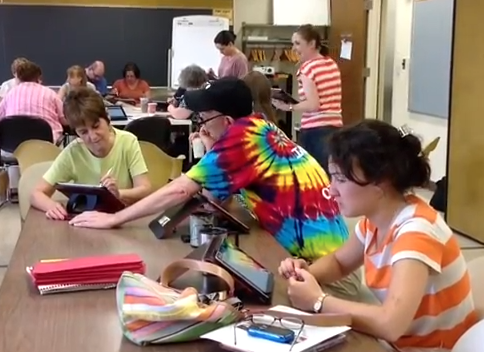 For half a day, the new students will rotate through six 25 minute sessions which will expose them to some of the basic skills and workhorse apps that the iWizards have deemed most important for getting started at Mercy. The girls rehearsed for two hours, using their Apple TVs, iPads, and projectors. While they worked out the kinks in their presentations (both delivery and media), they were coached by staff members they had personally invited to join their teams. The entire operation involved almost forty students and staff. Guess what? We had 100% attendance, even though their peers were fleeing the school after dismissal like a sinking ship! I knew these folks were devoted to the project, but I was impressed by the commitment to the rehearsal. This entire endeavor has been challenging to organize, but the level of dedication by the participants insures that our new students will have a very rich and beneficial experience.